One of the most popular activities for kids and early teenagers. Oasis Sea World is located on the mainland between Trat and Chantaburi in the town of Laem Sing. Best to visit when traveling to Koh Chang with any type or private transport (including our own Koh Chang minibus or a Bangkok Limousine to Koh Chang), or when heading back to the international airport or Bangkok city, but you can also join a tour group on the island. More information on swimming with dolphins in Thailand here. Pretend to be Tarzan for a day and swing and glide between the tree tops on nearby Bai Lan Beach. 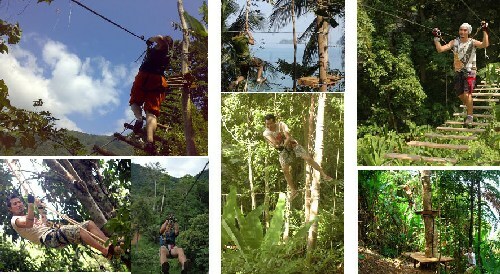 You will have hours of fun with rope bridges, tarzan swings, flying skateboards and giant zip lines. After a mandatory briefing during which you will be taught how to use the slings, carabiners, pulleys, and harnesses safely, you will be swinging from elevated platform to elevated platform and from tree to tree for the better part of a day. Pick up service from the Siam Bay Resort is available several times per day, just ask our reception staff to book for you. Minimum height for kids is 110 cm. There are several elephant camps on Koh Chang that all offer very similar tours on elephant back trough the jungle of Koh Chang. If you book the longer trek, you will also get to bath and wash the elephants. Prices are the same in every camp, but most of our guests seem to prefer the Baan Kwan Chang camp and tour in the Klong Son valley on the northern side of Ko Chang. It will take you about 30-45 minutes to get there by Song Teaw, so families with younger children may prefer one of the 3 elephant camps that are located in the Klong Prao area. Free transport, some refreshments and fruit is offered by all 4 camps. Although you will be able to find plenty of fish and other sea life on and around the rocks on the southern side of the Siam Bay Resort in front of the Phu Pha Buri family bungalows and the Baan Rim Talay Sea side bungalows, snorkeling there won't give you the same experience as when you head one of the many snorkeling trips to what we call the outer islands just south of Ko Chang. All of these trips will eventually take you to the islands around Koh Rang, but some of the the more expensive ones will also stop a few more quiet locations along the way. Bigger boats will usually offer Thai and or western buffets on board, but can take as long as 8 hours from departure until return. If you do not wish to spend the entire day on a busy boat, it will be quicker to use one of the snorkeling trips by speedboat or you can book a private speedboat trip from Koh Chang. You will then be traveling much quicker and with a smaller group, but food and facilities will, obviously, be less than on the converted fishing boats or other larger boats. During the high season many of these trips are available daily and can be booked on short notice. During the low season, also known as the green season, some operators will decide on a daily basis if they will go out, while others close down for the season. Typically the water will be less clear and the waves higher during this time of the year, due to a change in wind direction around the 15th of May. During these time they may also choose for alternative locations. Snorkeling enthusiast that enjoy the coral and sea life so much that they would like to like to see it every day, may also be interested in combining their stay at the Siam Bay Resort with a stay in our closely related Beach Resort on Koh Kood, where you can snorkel between the many corals right in front of our own pier and all year round. Ideal for a rainy day or when the kids are away enjoying other adventures: Learn to prepare Thai food from English speaking teachers at Thai cooking classes on Ko Chang. Don't expect to become a Thai Chef in a single day, but learning some basics like wok frying, selecting and combining ingredients and just remembering the names of some of your favorite Thai dishes can really make it a enjoyable (half) day and you might be able to surprise friends back home by serving authentic Thai food at your next dinner party. There are 2 or 3 cooking schools that offer these Thai cooking lessons, but on certain occasions we also offer these cooking classes in our own kitchen or restaurant, so make sure to check with our reception or the manager or cooks, before you head anywhere else. The Klong Plu waterfall is the biggest waterfall on Koh Chang and definitely worth a visit. If you can, try to visit it on weekdays when there are very few Thai tourists on the island, because waterfalls tend to be their favorite place to visit. You can get to the Klong Plu waterfall by one of the many motorcycles that we have available for rent or you can book a private taxi or minibus, if riding a motorcycle on small roads across mountains isn't your thing. We don't recommend waiving down the shared-taxi / bus service to go there, unless you can convince the driver to take you all the way to the ticket booth. Even from there it's still a 600 meter walk up the mountain to find a descent pool at the end of the rather impressive waterfall, but there are several resting areas along the path that follows the river upstream and when you come back down there are a couple of small restaurant were you can replenish the fluids you lost climbing up the somewhat uneven path to the Klong Plu waterfall. Best time to visit is between early Dec. and Feb. when there is plenty of water falling, but even in April it can still be impressive and a lot more quiet. There are a few good guides on the island that will take you jungle tracking deep into the jungle and mountain hiking up some of the highest peaks on Koh Chang. Using the service of an official park ranger may sound like a very smart thing to do, as they will know the entire area like the back of their hand, but according to previous guests, most of these guys speak very little English making the trip more like a race with a few fingerpointings along the way, than a learning experience about the wild life on Koh Chang. For Siam Bay Resort guests the trekking company in Bang Boa that organizes treks to the Kongoi jungle is the most convenient and interesting place to visit. Several different types of treks are available, ranging from family treks to mountain climbing. Be prepared to get sprayed with the strongest bug spray that is available before starting your Jungle Trek or Mountain Hike! As you can tell from the many fishing boats you can see on the horizon at night and the smaller private fishing boats you will see during the day, Koh Chang is an excellent place to catch many types of fish. And even though we offer quite a lot of fresh seafood on our beach BBQ, we can imagine that you sometimes prefer another type of fish on your plate. If that is the case you will have two options: 1) ask the F&B manager or chef to order it for you from the fisherman village or local market the next day or if know how to catch your own: 2) head out on a day- or night time fishing trip around Koh Chang. Currently the Sea Hunter fishing trips departing from Ban Bao bay are the best known on Koh Chang, but you can also ask around to see if there isn't something smaller, usually privately owned, available. However, especially if you plan on going deep sea fishing or if you require some comfort while fishing, we recommend the 20 meter long, 5 meter wide Sea Hunter boat, because it has and air-conditioned cabin with shower and toilet, a GPS and, more important: a fish finder system and kitchen on board. Whether you want to first go squid fishing followed by regular fishing for the bigger fish during the night or prefer to wait for a catch while catching a tan: both is possible with these fishing trips on Koh chang. As with nearly all activities on the island, a pick up service from the Siam Bay Resort to Bang Bao is available. As there are no golf courses worth mentioning on Koh Chang, many beginning and long term golfers have been sighted making practice "air" swings in their hotel rooms or even on our lonely beach itself. If, despite the tropical temperatures you still need your fix, there are now two driving ranges on Koh Chang: one at the Koh Chang's "Airport" (the landing strip for the ultra lights that are sometimes allowed to fly and sometimes not) where there are only a few golf clubs for rent and everything is done by hand and another, a bit more professional looking, driving range on Koh Chang that can be found in far away Klong Son. ATV tours: discover the Chai-Chet area by 4 wheel driven motorcycles in 60, 90 or 120 minute tours. Yoga classes: Baan Zen on Klong Prao Beach offers "Yoga - Reiki - Meditation - Chakras balancing" workshops for 2 to max. 4 persons per workshop. Yacht or Catamaran charters: Hire a yacht with or without staff to discover the Koh Chang Archipelago in your own pace.